Manam (Papua New Guinea): (21 Mar) Explosive activity continues. Volcanic Ash Advisory Center (VAAC) Darwin warned about a volcanic ash plume that rose up to estimated 15000 ft (4600 m) altitude or flight level 150 and is moving at 10 kts in E direction. Ibu (Halmahera, Indonesia): Explosive activity continues. Volcanic Ash Advisory Center (VAAC) Darwin warned about a volcanic ash plume that rose up to estimated 8000 ft (2400 m) altitude or flight level 080 and is moving at 10 kts in NE direction. 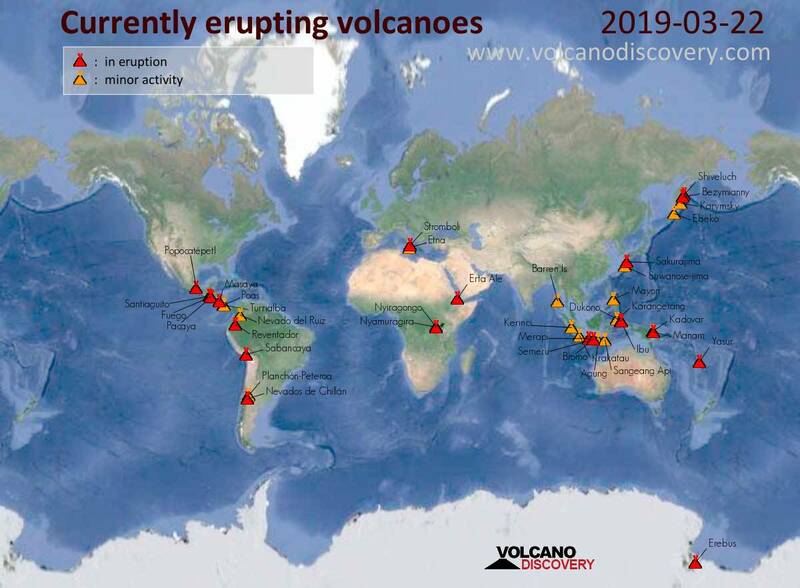 Volcanic Ash Advisory Center Darwin (VAAC) issued the following report: ONGOING ERUPTION TO FL100 LAST REPORTED AT 22/0400Z. Volcanic Ash Advisory Center Darwin (VAAC) issued the following report: CONTINUOUS VA ERUPTION TO FL100 EXT TO SE. Dukono (Halmahera): Explosive activity continues. Volcanic Ash Advisory Center (VAAC) Darwin warned about a volcanic ash plume that rose up to estimated 6000 ft (1800 m) altitude or flight level 060 . Volcanic Ash Advisory Center Darwin (VAAC) issued the following report: VA OBS TO FL070 EXT E TO SE AT 21/2140Z. Sabancaya (Peru): Explosive activity continues. Volcanic Ash Advisory Center (VAAC) Buenos Aires warned about a volcanic ash plume that rose up to estimated 30000 ft (9100 m) altitude or flight level 300 and is moving at 10 kts in S direction. Explosive activity continues. Volcanic Ash Advisory Center (VAAC) Buenos Aires warned about a volcanic ash plume that rose up to estimated 30000 ft (9100 m) altitude or flight level 300 and is moving at 20 kts in E direction. Nevados de Chillán (Central Chile): (22 Mar) Explosive activity continues. Volcanic Ash Advisory Center (VAAC) Buenos Aires warned about a volcanic ash plume that rose up to estimated 12000 ft (3700 m) altitude or flight level 120 .